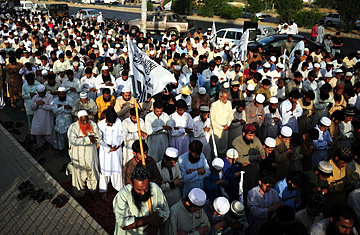 Activists of Jamaat-ud-Dawa offer funeral prayers for Osama bin Laden on a street in Karachi on May 3, 2011. Hundreds of people offered special prayers for Osama bin Laden in the populous Pakistani city of Karachi May 3, where the organisers declared the Al-Qaeda chief as a martyr, police said. When President Asif Ali Zardari's phone rang at 1.15 a.m. on Monday, it was President Barack Obama on the line, with news that a U.S. operation to eliminate Osama bin Laden and retrieve his body had been successful. That phone call, Pakistani officials tell TIME, was the first that their government heard about a U.S. military operation conducted just three hours' drive from Islamabad. There was no mistaking the obvious mistrust from Washington in the timing: Pakistan's military establishment only learned of the raid when it was too late, according to government and military officials. U.S. helicopters were able to swoop in from Afghanistan undetected, as Pakistani radars had been jammed. The Pakistan government, in a statement, tried to explain this away by saying, the choppers took advantage of "blind spots in the radar coverage due to hilly terrain." By the time Pakistani fighter jets set off to pursue them, it was too late. The discovery and death of bin Laden on Pakistani soil has been a source of great embarrassment here. Throughout Monday, both the government and the military struggle to form a response. Some officials made clumsy attempts to suggest that there had been some form of cooperation, but a government statement on Tuesday conceded that Pakistan had been kept out of the loop. A senior Pakistani military tells TIME that they did not know of the raid, but calls attention to remarks by Obama and by Secretary of State Hillary Clinton, insisting that it had been Pakistani intelligence cooperation that first put the U.S. on the trail that enabled them to locate bin Laden's compound in Abbottabad. Still, Pakistani officials believe the U.S. decision to leave them in the dark was based on deep mistrust. "Such actions undermine cooperation and may also sometimes constitute [a] threat to international peace and security," the Pakistan government statement added. The Pakistani military official would not comment on whether the army or its intelligence service, the Directorate for Inter-Services Intelligence (ISI), had been aware of the compound or of bin Laden's presence there. The ISI had raided the same compound in 2003, in pursuit of al-Qaeda leader Faraj al-Libi. That raid, they insist, was crucial to his arrest the following year. Since then, their sights had drifted from the area, but officials insist that the ISI had as recently as last month furnished the CIA with intelligence about the presence of foreigners there. U.S. officials, however, appear to believe that at least some in the Pakistani security establishment had knowledge of bin Laden's presence. And the Pakistanis believe that staging a raid of this type deep inside Pakistani territory without first clearing the operation with Pakistani authorities was "meant to teach a lesson," says a senior Pakistani official. Despite the mistrust between them, however, the U.S. and Pakistan have no choice but to continue their fractious relationship. Marc Grossman, President Obama's Special Envoy to Afghanistan and Pakistan, arrived for talks with senior Pakistani officials on Tuesday. His message, paraphrased by a cynical Pakistani official, was that Washington is prepared to work with Pakistan if they behave like "good boys". Grossman's visit came in the course of a prescheduled visit to meet with top Pakistani and Afghan officials. But the bin Laden raid loomed large in his meetings with the Pakistanis. Relations between the two sides had reached a low point in the weeks before the bin Laden raid. Following the six-week standoff over the fate of Raymond Davis, a CIA contractor who had killed two Pakistani men in an incident in Lahore in February, there were fierce disagreements over the use of CIA drone strikes targeting suspected militants in the tribal areas. Pakistani officials expect Washington to use their embarrassment over bin Laden to leverage more cooperation from them. One consequence is expected to be a renewed escalation of the drone strikes  there have been just two since March 17. There may also be more pressure on Pakistan to help the U.S. in Afghanistan. Washington is deeply concerned about links between the ISI and the Haqqani network based in North Waziristan, whose fighters are among the most ferocious facing NATO in Afghanistan. Pakistan has long resisted against Taliban groups that confine their activities to fighting Western forces across the border. The Pakistan Army typically fobs off U.S. pressure with a plea that it too overstretched to launch a military offensive in North Waziristan, and that other challenges take priority. Now, it may find itself pressed into launching the campaign the U.S. has long demanded. Greater cooperation with the U.S. on Afghanistan would limit Pakistan's ability to shape the Afghanistan endgame to its own interests, which include cementing a key role for its pro-Taliban allies in post-U.S. Where the Pakistani side had used the showdown over Davis to push back against the U.S., the bin Laden raid puts them back on the defensive. Besides rising pressure from the U.S., Pakistan's security establishment also faces a challenge from within. The realization that it was either unable to find bin Laden in its own back yard, or else was hiding him, has further eroded public confidence. "They've been caught with their pants down," says a senior opposition politician, asking to remain unnamed. Notably, there has been little public outrage at the raid, which will come to the combined relief of U.S. and Pakistani officials. While militant groups like the Lashkar-e-Taiba condemned the killing and offered funeral prayers in his honor, there has been no great show of rage on the streets. But the Pakistani Taliban have made their intent plain. Regardless of the facts, they are convinced that the Pakistanis helped get bin Laden  and they have vowed to exact revenge in Pakistan's cities.